Before I start this review, I want to challenge those of you who have never seen this anime yet are reading this review. More people than I want to admit quit this anime way too soon believing that there is no way it can become great. That is just not true. I challenge those of you who question my 5/5 to please watch episodes 1-26 in their entirety. If even by this point you do not like the show then your assumption was correct; however, if I can get even one person to come to know how amazing Eureka Seven is by making them watch to episode 26, at least, then I have accomplished my goal here. 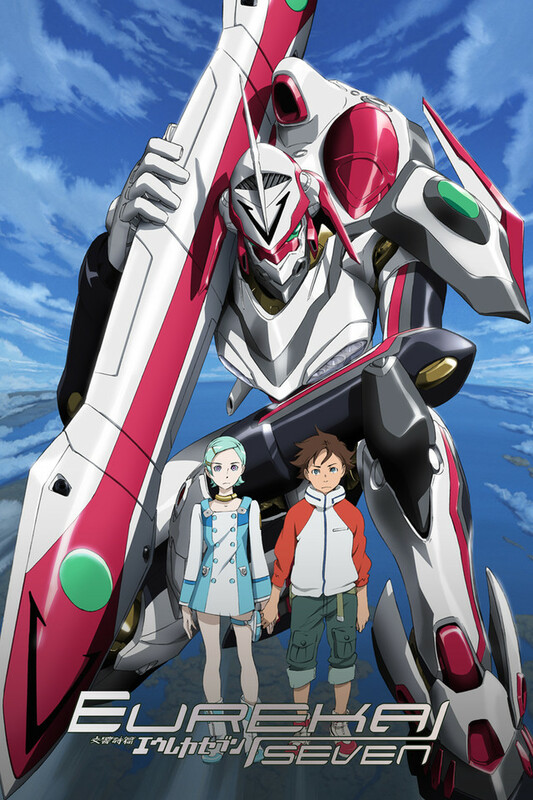 Now, most mecha genre will throw in a half-assed romance to just add another element to the plot of a show, but Eureka Seven takes it's time to really make the romance a main draw of the show, not the mecha. Before Kimi no na Wa, I would, in my own opinion based off what anime I have seen, easily classify this as the best romance in animation. Period. The show follows the young Renton Thurston, and his ever growing relationship, with the crew of Gekkostate, a rogue band of misfits, and Eureka, a girl that has more to her than meets the eye. Renton is your average teenager with mood swings, hormones, and a feeling of false invincibility. As you begin to watch Eureka Seven, the show tends to be tough to "get a feeling for" and that is because you are watching a teenager done well. This is not a cliche SoL show where the middle school student is as mature as an adult, but a true to form view of what an average teenage boy going through puberty experiences. Because of this, Renton, in the start of the show, is not a likeable character for those of us who are adults already. It feels just like you are watching your cringy angsty 14 year old self; however, that does not mean he stays that way forever. Along the way, you watch as Renton truly grows as a character and a human being. Ultimately culminating in what I think is the best coming of age, and romance, anime of a generation that was created over 10 years before Kimi no na Wa was even a thing. Amazingly animated 2D mecha, a godly soundtrack, and a well done character driven story makes this an absolute MUST WATCH. This is the first anime I really got into and man, it's still great to rewatch after all this time. So pumped for Hi Evolution. This is a perfect blend between action and romance. It will hit you right in the feels at times. You will hate that its over in the end, and will wish it would continue. This show was my favorite anime for about 9 years straight, until your lie in april released. The anime has amazing character growth from many of the characters, especially the MC Renton Thurston. Over the course of 50 episodes which I have watched 6+ times, you obtain a amazing sense of connection to the Gekko State as they take down the government and prevent the destruction of the world. A large portion of the anime is following the romance and growth of Eureka and Renton as they grow closer together, learn more about each other and getting along, and understand the world as a whole. I am a complete and utter fanboy of this show, and still have t-shirts from the collectors editions dvd's I collected as they released. Its a little slow until episode 4, but then you become attached to the characters, and the world as a whole as meticulous amounts of details are spent exploring and unraveling the worlds secrets backed by an amazing soundtrack. This show is a bit of a battle to get into. The first few episodes do not move at what I would consider to be a traditional pace for a block buster anime. I can tell you this, the longer you watch the more important the details become. The greater the plot. What an amazing series. There are no words to describe this series... but I will try. First of all, I want to express how difficult it is to find mecha anime with such a strong and developing love interest. However, Eureka Seven has exactly that. The characters truly learn and grow as the series moves on and has one of the most powerful instances of young love and love at first sight. Renton already begins with a pretty unique storyline, as well as Eureka. They experience many harrowing and wonderful adventures together, each instilling a new trait into their personality, building a strong story and development. My favorite motif in the entire show is how Renton always accepts and love Eureka, despite her flaws and despite how she changes; physically and mentally. It shows what love should truly be about and that there are no boundaries that it can't cross. "Don't beg for it, earn it and it will be granted to you"
I remember watching bits and pieces of this show back when I was a little girl. Rewatching this series now as a woman who has gone through the phases of "growing up," this anime is seen to me in an entirely different light. The greatest thing about this anime (in my opinion) is the change and growth we see in Eureka and Renton. Renton, because he realizes that his world isn't dandy and perfect and Eureka because she realizes that the world isn't half bad so long as she has people that she loves by her side. This was my first Gundam stylized anime and it showed me the genre. This show was sad and very cool. The characters were very detailed and awesome. The anime had a nice romance aspect in the later anime. The main character, Renton, is slightly perverted so you get a funny vibe from him however he starts to sort of grow on you as the story goes on. Yes, the anime is very stretched out and slow, however that should not take away from the viewing experience.